knuckle on the thumb of my right hand. in the sands of the Sleeping Bear Dunes. by calling out to locals from his window. it wasn’t in our family anymore. We couldn’t drop in for tea. as they spun coir rope from the fibres of coconut husks. at the edge of the Arabian Sea. Copyright © Sneha Madhavan-Reese. Originally published in Rabbit Poetry Journal. 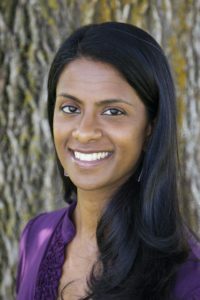 Sneha Madhavan-Reese is the author of the poetry collection Observing the Moon. She is the 2015 winner of Arc Poetry Magazine‘s Diana Brebner Prize and was a finalist for a 2018 National Magazine Award. Her writing has appeared in publications around the world, including The Best Canadian Poetry in English 2016. She lives with her family in Ottawa.